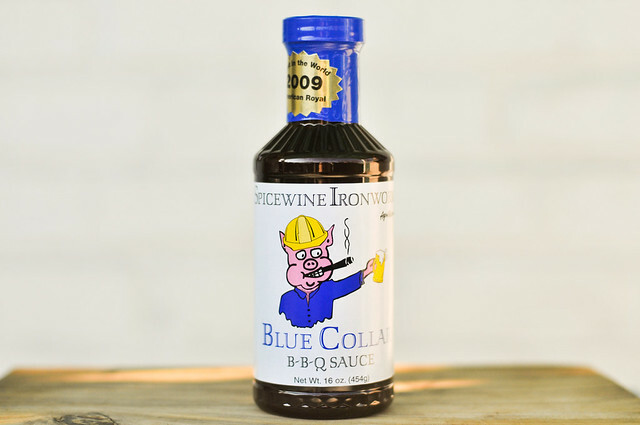 Spicewine Ironworks Blue Collar B-B-Q Sauce hits heavy with the tomato, which may be a tad too dominante out of the jar, but finds a nice balance with some added sweetness after being grilled. 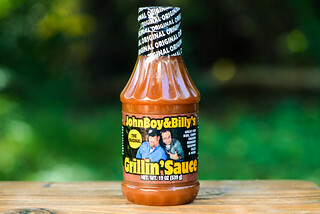 This sauce was lovingly sent to me from Meatwave fan Betsy as a local favorite of hers from Columbia, Missouri. Spicewine Ironworks started up businesses in 2004 between three veterans of the barbecue competition circuit, Jay Curry, Steve Curry & Randy Ham. They produce a line of commercial smokers as well as full array of barbecue goodies like rubs, marinades, woods, and, of course, sauce. They currently have five different sauces as part of their large barbecue arsenal. Molasses and tomato dominate in the aroma department. The tomato is heavy and not sweet smelling, conjuring up similarities to tomato paste. The molasses is equally weighted, but adds more depth than sweetness. There are oniony notes in there, and just a faint kick of vinegar as well. This is a pretty thick and textured sauce. It clings heavily to a suspended spoon, falling off slowly in just one or two globs, with most of the sauce staying securely put. There are not many visible spices, but they may just be masked by the dark maroon color. Coming in close to the texture, there's a heavy taste of tomato paste, which a texture to match. The tomato is deep and strong, with molasses adding just a bit of sweetness that comes out right before the vinegar tang starts to kick in. As the sauce settles on the tongue, a light smokiness starts to come out and continues to linger after being swallowed. There are onion and garlic components in there as well, but they're really secondary to the dominate tomato and molasses. The sweetness that I felt could have been more present out of the jar was amped up after being cooked. Tomato was still the hard hitter, but the extra sweetness gave it a better balance in the end. The thick sauce coated the chicken very well, then caramelized just enough over direct heat. The best part were the crispy, caramelized bits that may have looked too blackened, but were actually little pockets of amazing flavor. Overall this was decent sauce, if not incredibly exciting. 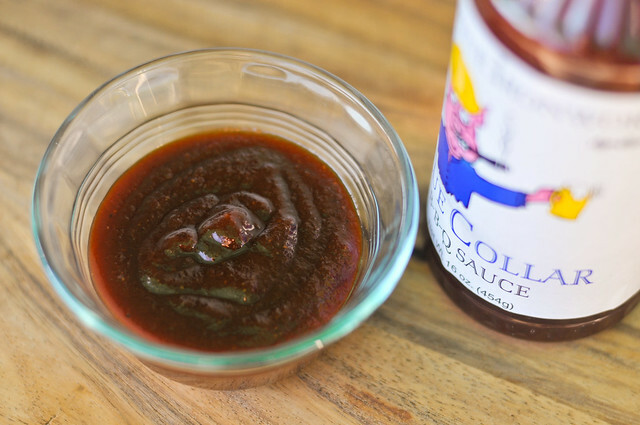 If you prefer a sauce with less sweetness and a heavy, robust tomato flavor, this is for you. I found it a little out of balance out of the jar, but that was fixed with some added sweetness after being grilled—which created very tasty crispy bits. 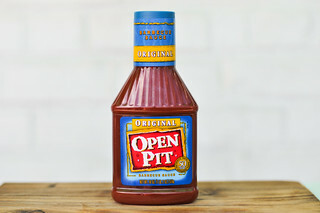 Its because of this that I'd recommend this sauce mainly for your basting needs. It was very good on chicken, but had a strong flavor that could hold up on stronger flavored meats as well. 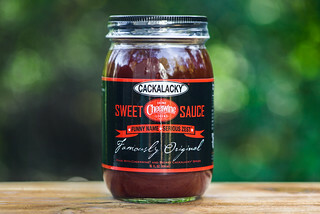 Being sweet and having a good bit of corn syrup in it, would you say it's similar to a sauce like Blues Hog? @Chris No, this is very different than Blue Hog--it's not as sweet, not as syrupy, and doesn't have as much spices to it. Spicewine actually didn't have the HFCS feel that I sometimes find off-putting, it was closer to the taste and texture of tomato paste. With all that HFCS why isn't this product on the syrup isle? 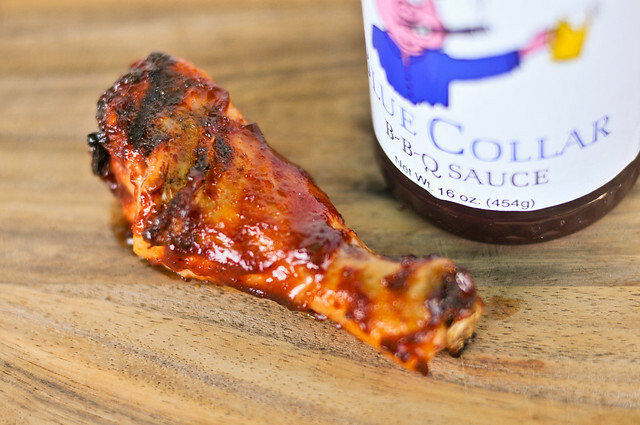 It shouldn't be called BBQ sauce. Lacks a lot of things in my opinion. Not a fan, maybe give it a 5?